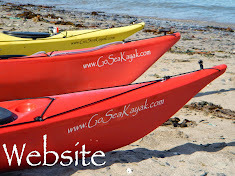 I'm sure you can imagine the scenario, sunny day, light winds, gentle 18 mile paddle along the coast before setting up camp in the sand dunes. Sounds lovely. I was meeting up With Eurion, Chris & Adrian at the Knap & to be joined by Stuart & Marcus as we reach Aberthaw. We set of in lovely sunshine from the Knap, dressed lightly given the weather. Passing Rhoose Point, the most southerly part of mainland Wales. And start heading out to the tower at Aberthaw in perfect conditions. Then it hit! I thought it might just be a gust, but know, it kept blowing & was constant F4 into our faces. This was going to be a slog. I had a quick play before heading back in to meet the others, including Stu & Marcus who were waiting on the beach. Some of the group opting for warmers layers before heading off again. We passed this cheeky chappy on the way to Llantwit. Where we stopped for a rest as we were in need of a break. Chris decided to get off the water here & blag a lift of his misses. Cant say I blame him, I was seriously thinking of camping at Monknash a few miles further on. This trip really was a slog. as we pass St Donats. I leave the others hugging the shore whilst I head into the flow & rougher water to Nash Buoy. I was really easy to spot the flow as the wind on tide was making it rather rough, further in, in the eddies it was completely different. Stuart & Marcuss play in the breakers. Approaching Witches point I spot another seal but I'm a bit too pooped to care. I help out with some boat carrying before getting back underway, just to the other side of the river to set camp in the sand dunes. I really need some chillout time. After a long drag up the beach with the kayak I find the perfect spot. Before settling down to watch the sun set. Sunday morning & the conditions are perfect. Turbo brekkie, Scottish Oats with mixed nut & raisins & almond milk. I very slowly got ready as I was in no rush before pushing off into glassy seas. Approaching Aberthaw & the wind is picking up nicely. Its peak flow too so I power on putting some miles behind me. Looking back in some masochistic way I quite enjoyed that trip. I lost the will to take pictures though, so I'm glad you made the effort.